Walking inside this half boutique, half cafe in Launceston, the first thing that came to mind was how much damage I could do to the credit card on some of the beautiful pieces and the second was wholly moly, they have a Nutella hot chocolate, I’ll start with one of those thanks. 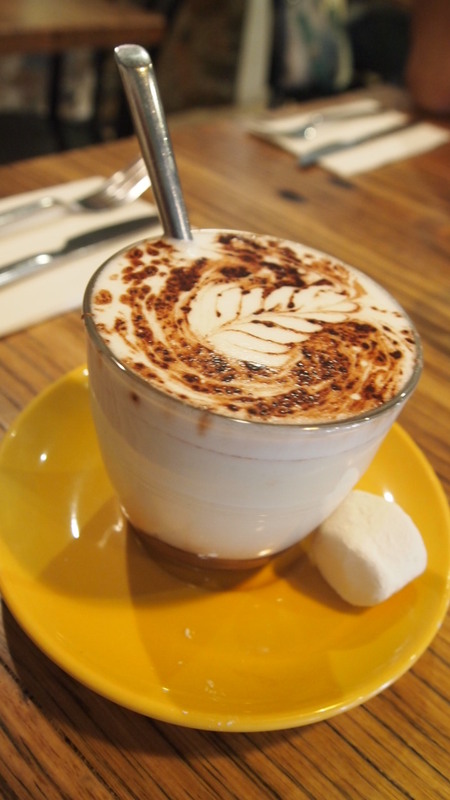 Served in a standard latte glass, the bottom is filled with a good dollop of Nutella and topped with warm milk. Give it a good stir and once blended you have is a truly wicked drink, one that I simply couldn’t put down and left me wanting more. Being a Saturday the food offering was limited to all day breakfast, with no lunch options available. Some may question this, but others like me relish in the opportunity to have runny eggs and bacon all day long. The menu isn’t huge, but what it lacks in size it makes up for in quality and variety. For those after something simple there is smashed avo or granola, but if you’re after a fancier meal they offer truffled eggs or salmon and smoked chats, yes please! We opted for one of each a sweet and savoury dish to share. 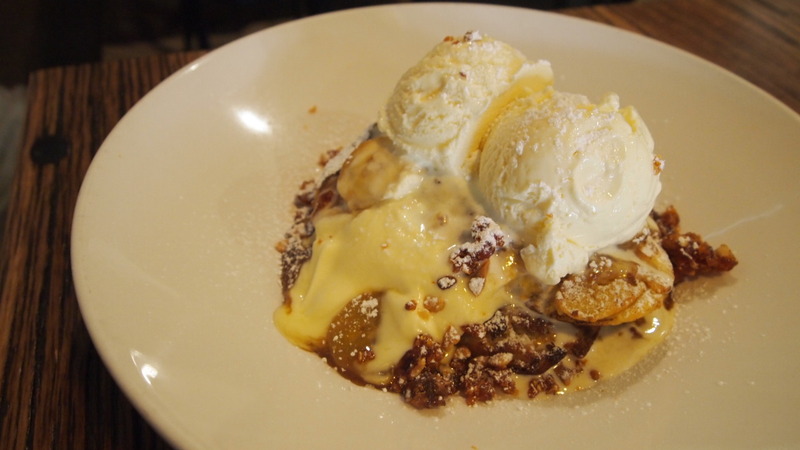 First up were the fluffy ricotta pancakes with sweet butterscotch bananas, crunchy peanut brittle and double cream. As every element on this dish was packed with sugar, it was a bit sickly sweet at times but it’ll have sugar addicts jumping for joy. For me, it was enjoyable to eat although needing something to cut through the sweetness. In the absence of a balancing element, this is one dish that is probably best shared with others. 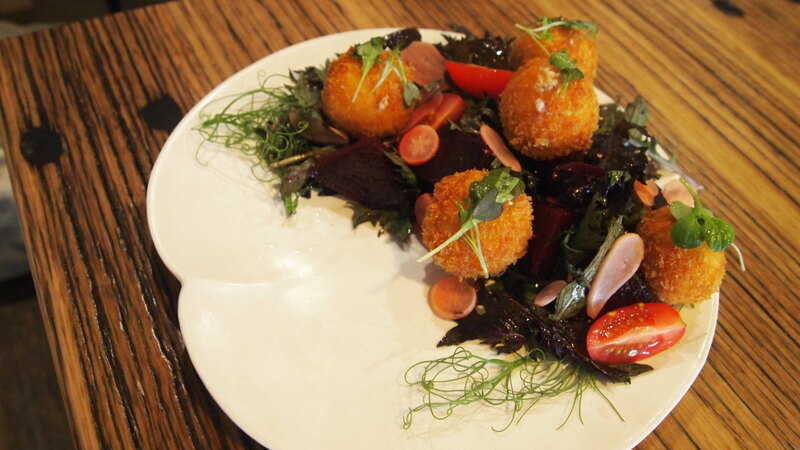 Next up was the delicious little goats cheese fritters served with a fresh salad of mixed leaves, tomatoes, radishes and beetroot. 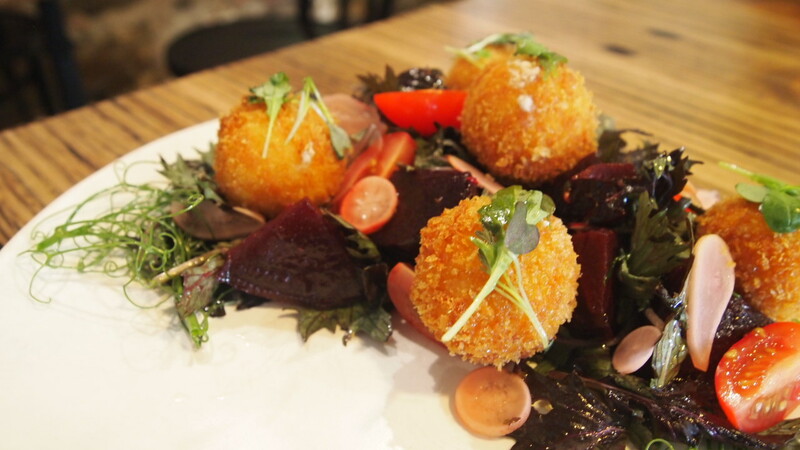 Cut into the crisp round balls to reveal a smooth and creamy goats cheese filling which was simple but delicious. We were almost fighting over the five fritters, quickly finishing one and grabbing another to ensure we got as much of the cheesy goodness as possible. Food and drink are obviously a big part of what makes a cafe successful, but without great staff a venue can lack soul and character. Well you definitely can’t say this place lacks soul thanks to the incredibly friendly and charismatic staff. They were welcoming and accommodating, making our visit a very memorable one. 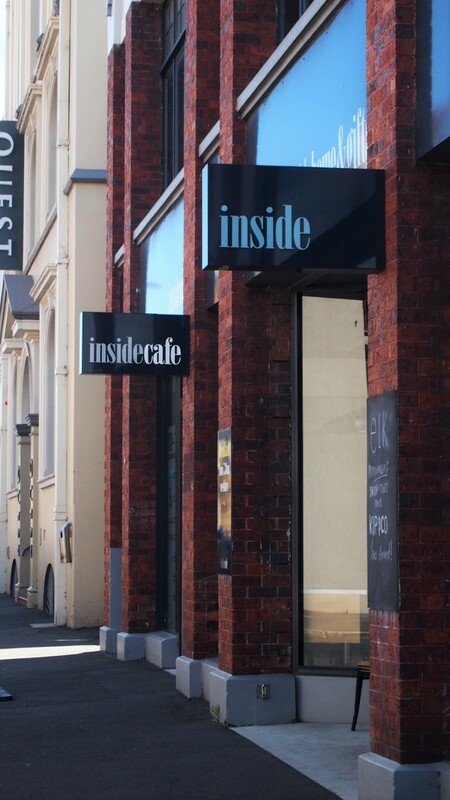 Bringing a bit of big city culture and food to Launceston, Inside Cafe is a breath of fresh air in a town filled with average eateries. So when in town take a seat Inside and experience some of the best this town has to offer.